The Winter Solstice falls on Wednesday, December 21, 2016 at 10:44 a.m. Universal Time (5:44 a.m. Eastern Time), according to the U.S. Naval Observatory. 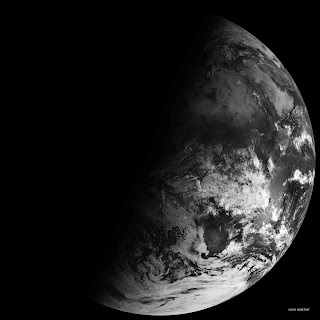 The Winter Solstice, as pictured in the above NASA image, is caused by a tilt of the earth's rotating axis and marks the first day of winter. It is the shortest day and longest night of the year in the northern hemisphere for locations like Melbourne, Florida, but the reverse happens in the southern hemisphere for locations such as Melbourne, Australia. The Winter Solstice can occur on December 20, 21, 22, or 23, depending on calendar events such as leap year and when the Solstice begins relative to Coordinated Universal Time. On March 20 and September 20, the terminator is a straight north-south line, and the Sun is said to sit directly above the equator. On December 21, the Sun resides directly over the Tropic of Capricorn when viewed from the ground, and sunlight spreads over more of the Southern Hemisphere. On June 21, the Sun sits above the Tropic of Cancer, spreading more sunlight in the north and turning the tables on the south. The bulge of our spherical Earth blocks sunlight from the far hemisphere at the solstices; that same curvature allows the Sun’s rays to spread over more area near the top and bottom of the globe. But how can it be called the First Day of Winter and Mid-Winter at the same time? Although the December Solstice marks the beginning of Northern Winter, it is often called Mid-Winter. The difference lies in the definitions created by culture, agriculture and astronomy. According to astronomers, December 21st marks the beginning of Winter in the Northern Hemisphere and the beginning of Summer in the Southern Hemisphere. The official start and end of Winter can vary by country - not because Winter starts a week or so earlier in one country than another in the same hemisphere, but because the recognition of the start of Winter is often influenced by historical or cultural reasons particular to that country. Most countries recognize Winter as starting on dates ranging in November and ending sometime in March. Why does there seem to be such a lag time between the longest night and the coldest days? Blame the oceans, which heat up and cool down slowly. Although the Winter Solstice marks the lowest exposure of the northern Atlantic and Pacific Oceans to the Sun's heating radiation, the oceans are still warm in the Northern Hemisphere from the summertime, and that delays the peak heat by about a month and a half. Similarly, in June the water still cold from the Winter, and the average warmest days are still a month and a half ahead.